Intents are awesome. 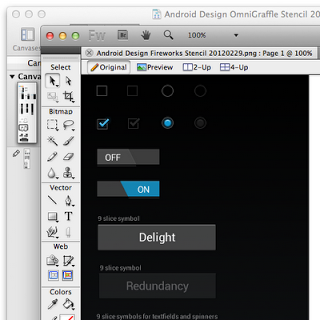 They are my favorite feature of Android development. They make all sorts of stuff easier. Want to scan a barcode? In the olden platforms, if you were lucky, this involved time and effort finding and comparing barcode-scanning libraries that handled as much as possible of camera interaction, image processing, an internal database of barcode formats, and UI cues to the user of what was going on. If you weren’t lucky, it was a few months of research & haphazard coding to figure out how to do that yourself. On Android, it’s a declaration to the system that you would like to scan a barcode. // I need things done! Do I have any volunteers? // place next time this application is restarted. //  The Intents Fairy has delivered us some data! See that? That’s nothing. That’s 5 minutes of coding, 3 of which were just to look up the name of the result you wanted to pull. And that was made possible because the Barcode Scanner application is designed to be able to scan barcodes for whatever other applications may need it. More important, our app is completely decoupled from the BarcodeScanner app. There’s no integration- in fact, neither application is checking to verify that the other exists. If the user preferred, they could remove “Barcode Scanner” and replace it with a competing app. As long as that app supported the same intent, functionality would remain the same. This decoupling is important. It’s the easy way. It’s the lazy way. It’s the Android way. One of the most inherently useful Android intents is the Share intent. You can let the user share data to any service they want, without writing the sharing code yourself, simply by creating a share intent. // Add data to the intent, the receiving app will decide what to do with it. // For a file in shared storage. For data in private storage, use a ContentProvider. Note that just by using setType() to set a MIME type, you’ve filtered down the list of apps to those that will know what to do with an image file. Less UI — You don’t have to clog up your UI with customized, clickable badges of services you support. Just add a “share” button. It’s okay, we’ve made sure all your users know what it does [insert smiley here]. Leveraged UI — You can bet that every high-quality web service out there has spent serious time on the UI of their Android app’s “share” activity. Don’t reinvent the wheel! Just grab a couple and go for a ride. Filtered for the user — If I don’t have a Foo-posting app on my phone, there’s a good chance I don’t care about posting to Foo. Now I won’t see Foo icons everywhere that are useless to me. Client App Ecosystem — Much like an email client, anyone can write a client for any service. 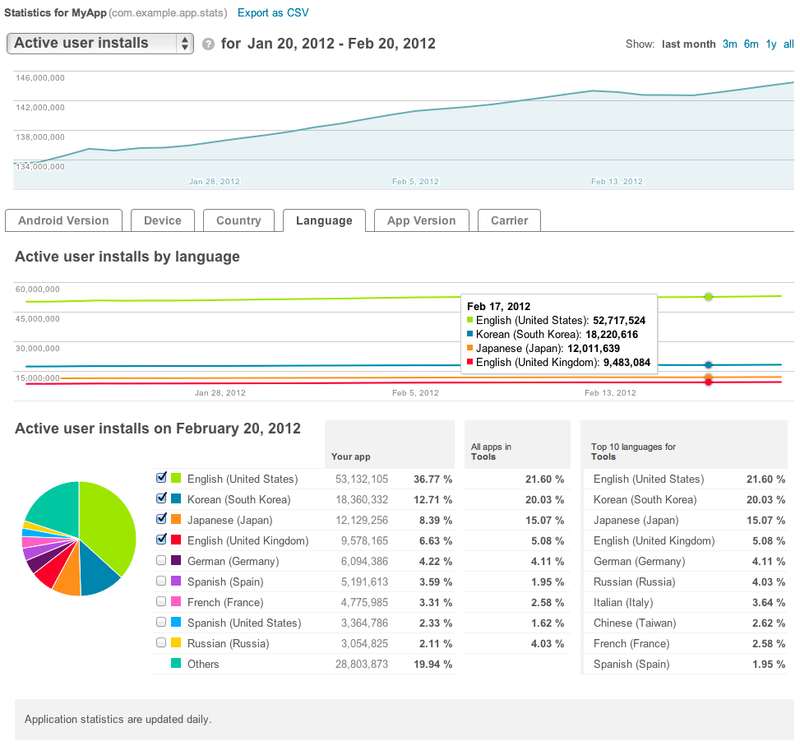 Users will use the ones they want, uninstall the ones they don’t. Your app supports them all. Forward Compatible with new services — If some swanky new service springs up out of nowhere with an Android Application, as long as that application knows how to receive the share intent, you already support it. You don’t spend time in meetings discussing whether or not to wedge support for the new service into your impending Next Release(tm), you don’t burn engineering resources on implementing support as fast as possible, you don’t even upload a new version of anything to Android Market. Above all, you don’t do any of that again next week, when another new service launches and the whole process threatens to repeat itself. You just hang back and let your users download an application that makes yours even more useful. For each pro of the Intent approach, integrating support to post to these services one-at-a-time has a corresponding con. Potentially wasted effort — Let’s say you chose one service, and integrated it into your UI perfectly. Through weeks of back-and-forth with Foo’s staff, you’ve got the API and authentication mechanisms down pat, the flow is seamless, everything’s great. Only problem is that you just wasted all that effort, because none of your user-base particularly cares for Foo. Ouch! Not forward compatible for existing services — Any breaking changes in the API are your responsibility to fix, quickly, and that fix won’t be active until your users download a newer version of your app. Won’t detect new services — This one really hurts. If a brand new service Baz comes out, and you’ve actually got the engineering cycles to burn, you need to get the SDK, work out the bugs, develop a sharing UI, have an artist draw up your own “edgy” (ugh) but legally distinct version of the app’s logo so you can plaster it on your home screen, work out all the bugs, and launch. 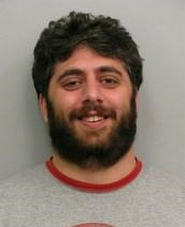 You will be judged harshly by your users. And deservedly so. With the release of ICS, a useful tool for sharing called ShareActionProvider was added to the framework, making the sharing of data across Android applications even easier. ShareActionProviders let you populate lists of custom views representing ACTION_SEND targets, facilitating (for instance) adding a “share” menu to the ActionBar, and connecting it to whatever data the user might want to send. // Get the menu item. // Get the provider and hold onto it to set/change the share intent. // like when the user selects a new piece of data they might like to share. // the default share history file is desired. Note that you can specify a history file, which will adapt the ordering of share targets based on past user choices. One shared history file can be used throughout an application, or different history files can be used within the same application, if you want to use a separate history based on what kind of data the user wants to share. In the above example, a custom history file is used. If you wish to use the default history for the application, you can omit that line entirely. This will help optimize for an important feature of the ShareActionProvider: The user’s most common ways to share float to the top of the drop-down, with the least used ones disappearing below the fold of the “See More” button. The most commonly selected app will even become a shortcut right next to the dropdown, for easy one-click access! You’ll also need to define a custom menu item in XML. Here’s an example from the ActionBar Dev Guide. And with that, you can have an easy sharing dropdown that will look like the screenshot here. Note that you get the nice standard three-dots-two-lines “Share” glyph for free. The share intent is the preferred method of sharing throughout the Android ecosystem. It’s how you share images from Gallery, links from the browser, and apps from Android Market. 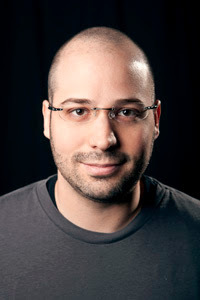 Intents are the easiest path to writing flexible applications that can participate in a rapidly expanding ecosystem, but they’re also the smart path to writing applications that will stay relevant to your users, letting them share their data to any service they want, no matter how often their preferences change over time. So take a step back and stop worrying about if your user wants to tweet, digg, post, email, im, mms, bluetooth, NFC, foo, bar or baz something. Just remember that they want to share it. Android can take it from there. With Android Ice Cream Sandwich, we set out to build software that supports emotional connections between humans and the devices they carry. We wanted to build the most personal device that the user has ever owned. The first ingredient in our recipe is to show users the people that they care about most in a magazine-like way. High-resolution photos replace simple lists of text. The second ingredient is to more prominently visualize their friends’ activities. We show updates from multiple sources wherever a contact is displayed, without the need to open each social networking app individually. Android is an open platform, and in Ice Cream Sandwich we provide a rich new API to allow any social networking application to integrate with the system. This post explains how apps like Google+ use these APIs, and how other social networks can do the same. 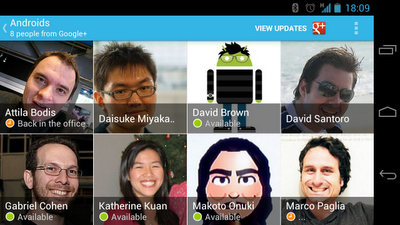 Since Eclair (Android 2.0), the system has been able to join contacts from different sources. Android can notice if you are connected to the same person and different networks, and join those into aggregate contacts. RawContact is a contact as it exists in one source, for example a friend in Skype. Data rows exists for each piece of information that the raw contact contains (name, phone number, email address, etc.). A Contact joins multiple raw contacts into one aggregate. This is what the user perceives as a real contact in the People and Phone apps. A sync adapter synchronizes its raw contacts with its cloud source. It can be bundled with a Market application (examples: Skype, Twitter, Google+). 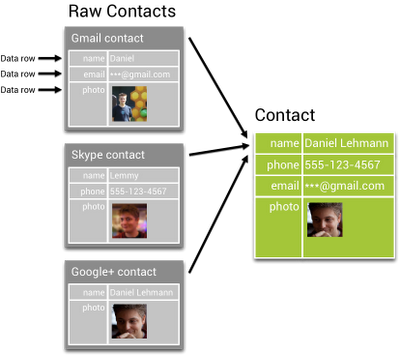 While users deal with contacts, sync adapters work with their raw contact rows. They own the data inside a raw contact, but by design it is left up to Android to properly join raw contact rows with others. 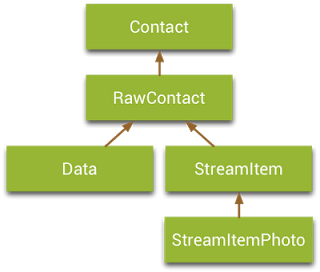 Contacts sync adapters have a special xml file that describes their content, which is documented in the Android SDK. In the following paragraphs, we’ll assume this file is named contacts.xml. The Android SDK also contains the application SampleSyncAdapter (and its source code) that implements everything mentioned in here in an easy to understand way. // Note that this URI is safe to call on the UI thread. This value is useful if you need to query the picture from the server (as you can specify the right size for the download). If you already have a high resolution picture, there is no need for any resizing on your side; if it is too big, the contacts provider will downsample it automatically. For best results, store uncompressed square photos and let the contacts provider take care of compressing the photo. It will create both a thumbnail and a display photo as necessary. This API is available on API version 14+. For older versions, we recommend to fallback to the old method using ContentValues and assuming a constant size of 96x96. The API for update streams is the biggest new addition for contacts in Ice Cream Sandwich. Sync adapters can now enrich their contact data by providing a social stream that includes text and photos. This API is intended to provide an entry point into your social app to increase user engagement. We chose to only surface the most recent few stream items, as we believe that your social app will always be the best way to interact with posts on your network. When displayed in the People app, stream items from all participating raw contacts will be intermixed and shown chronologically. Update streams are available on API version 15+ and are intended to replace the StatusUpdate API. For previous versions, we recommend that you fall back to the StatusUpdates API, which only shows a single text item and no pictures. 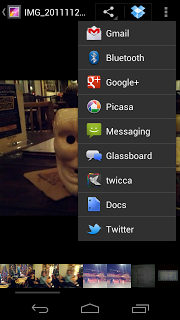 Ice Cream Sandwich is the first version of Android that supports the “Me” contact, which is prominently shown at the top of the list of the new People app. This simplifies use-cases that used to be a multi-tap process in previous versions — for example, sharing personal contact data with another person or “navigating home” in a navigation app. Also it allows applications to directly address the user by name and show their photo. The “Me” profile is protected by the new permissions READ_PROFILE and WRITE_PROFILE. The new functionality is powerful; READ_PROFILE lets developers access users’ personally identifying information. Please make sure to inform the user on why you require this permission. The entry point to the new API is ContactsContract.Profile and is available on API version 14+. Previously, connecting with users on a social network involved opening the respective social networking app, searching for the person and then connecting (“Friend”, “Follow” etc.). 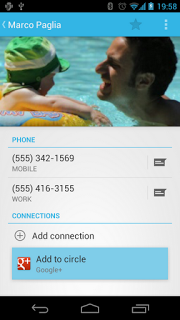 Ice Cream Sandwich has a much slicker approach: When looking at an existing contact in the People application, the user can decide to add this person to another network as well. For example, the user might want to follow a person on Google+ that they already have as a contact in Gmail. Once the user taps one of the “Add connection” commands, the app is launched and can look for the person using the information that is already in the contact. Search criteria are up to the app, but good candidates are name, email address or phone number. Be sure to use the same verb as you typically use for adding connections, so that in combination with your app icon the user understands which application is about to be launched. The “Add connection” functionality is available on API version 14+. High-resolution pictures need a lot of space, and social streams quickly become outdated. It is therefore not a good idea to keep the whole contacts database completely in sync with the social network. A well-written sync adapter should take importance of contacts into account; as an example, starred contacts are shown with big pictures, so high-resolution pictures are more important. Your network might also have its own metrics that can help to identify important contacts. When this Intent is launched, its data field will point to the URI of the raw contact that was opened. These notifications are available with API version 14+. 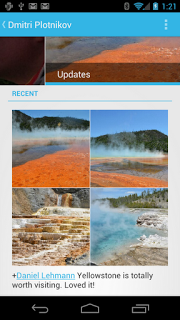 With Ice Cream Sandwich, we improved key areas around high resolution photos and update streams, and simplified the creation of new connections. Everything outlined in here is done using open APIs that can be implemented by any network that wants to participate. We’re excited to see how developers take advantage of these new features!